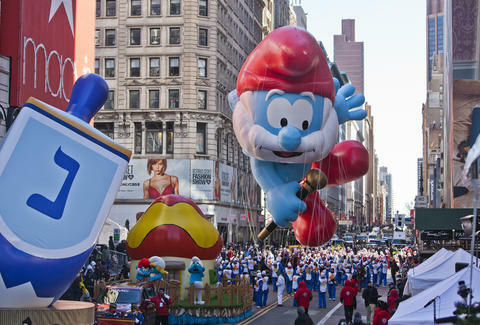 In addition to hand-turkeys, massive spreads of food, and historical inaccuracies, Thanksgiving's synonymous with one thing: the Macy's Thanksgiving Day Parade in NYC. For whatever reason, the parade broadcast's just one of those things people put on in the background while the rest of the family bickers about who voted for whom in the last election. Fun, right? Here's how to watch it this year. The peacock's got sole rights to the live broadcast this year, so if you've got cable/a digital TV antenna, tune to your local NBC affiliate to catch the whole show from 9am to 12pm EST. Update: It looks like NBC just has the rights to the live broadcast in front of Macy's. CBS, meanwhile, is actually broadcasting from further up the parade route near Central Park, although they're ALSO declaring you'll only see the parade on their channel. If you're not near a TV, you can also tap into the feed online by heading to NBC's site. There's one catch, though: you'll need a cable login to access the video, because there's no escaping the clutches of cable. If you're a cord-cutting millennial who's hosting Thanksgiving this year, you're probably too busy stressing over your green bean casserole to worry about watching the parade. On the off chance you're still clinging to tradition, though, have no fear: NBC's teamed up with Verizon to stream the parade live via Youtube. The stream will be a 360-degree video shot on five cameras, hosted by Marlon Wayans and Olivia Culpo. If you don't mind watching an inside view of the parade, hit up the embedded video above.